Hand made in Yorkshire. Deliciously moreish. Completely natural flavours. Suitable for vegetarians.What's in our crisps? Locally grown potatoes and parsnips, pure sunflower oil, totally natural flavourings and tender love care. 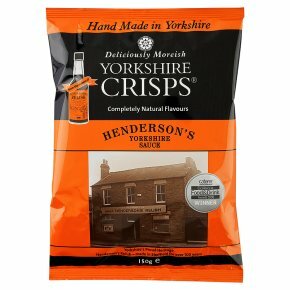 (full ingredients opposite) What's not in our crisps? Monosodium glutamate, artificial flavourings and colourings, preservatives or anything genetically modified. How do we make them? We slice selected varieties of potatoes, grown for us on the Yorkshire Wolds, hand fry small batches in hot sunflower oil for a few minutes, then sprinkle them with natural flavouring while still warm. The taste is remarkable. Enjoy! Where do we make them? At Wales Bar in South Yorkshire, just east of Sheffield and only minutes away from M1 junction 31, not far from our growers and our packaging suppliers, who are all in Yorkshire.